2000 Grand Prix Daytona 500 Nascar Pace Car Decals Stripes Kit. Decals are the first thing noticed. Be noticed not just seen! KIT CONTENTS / YEARS APPLY. 1 Door checkered stripe LH (with name) 1 Door checkered stripe RH (with name) 1 Quarter panel checkered Stripe LH 1 Quarter panel checkered Stripe RH 1 Rear bumper DAYTONA 500 decal Squeegee & Instructions. KIT COLOR / YEARS APPLY. BE SURE TO INFORM US OF COLOR NEEDED! 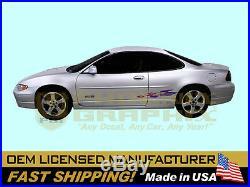 2000 General Motors GM Pontiac Grand Prix had reached its peak in both performance and styling. In fact, it was chosen to pace the 42th Annual Daytona 500 Nascar Race. Proudly, Pontiac created 2,000 replica pace cars for the public. Iconic, multi-colored, checkered-flag stripes had a fade-pattern in them that gradually changed from blue to purple to red. Within them, a dark metallic blue Daytona 500 proclaimed the race on each side and on the back. Only a limited run of these 4-color kits is available. ORDER NOW - PRE-APP® SLIDE-ON® SLIDE-OVER® - ORDER NOW. We highly recommend the use of our Decal Application/Protection products! There is no wiser investment than taking advantage of the benefits offered by PRE-APP®; SLIDE-ON®; and SLIDE-OVER® Protectant. Revolutionizing the industry since 1985! For over 27 years Phoenix Graphix, Inc. Has provided the most accurate and user complete licensed decal systems. Our low prices are guaranteed by the fact that we move very large volumes of merchandise and always pass the cost savings onto you, the customer. Even major Hollywood motion picture producers trust Phoenix Graphix for the silver screen. So now your vehicle is worth more than it has ever been, your restoration is nearly complete and you are ready for the crowning touch on your treasure; Decals & Stripes. Will just anyones stripe kit do? Sadly, anyone with a computer cutter and keyboard thinks they can provide to you the correct decal & stripes for your car. Before you place an order ask yourself these questions. Do other sellers know when to provide you Reflective White versus Gloss White? How about the right hues of Red? Or, when multi-colored decals are used? What if Metallic colors are originally correct? E-Bay sellers often ignore metallic because they cannot digitally print metallic and cant find correct vinyl! They think the customer will not know or care. Often correct colors can only be achieved by special mix screen printing ink. Also, dont think cutting a decal from a computer will always provide an acceptable result. Other sellers cut colored vinyl into small pieces, which causes a bumpy, railroad-track appearance. Remember: clear material center does not mean void-of-material center. Phoenix Graphix provides ONLY the correct color stripe for your vehicle! If the stripe came in Flat Black we will only provide Flat Black not Gloss Black (unless requested). No more worrying about correct colors or shades; we have it figured out for you! Did you know there are manufacturers using the least expensive, least durable and poorest quality vinyl yet dont disclose this? Cheaper, lesser quality material is available but is only intended for temporary application. Life expectancy of this less durable material is very short. At Phoenix Graphix we use only Automotive Grade material; 3M & Avery High Performance, Premium Grade 2ml vinyl. Furthermore, other manufactures provide stripes with deviations that may not be immediately noticeable. When you discover inaccuracies will you feel as good about your car as if it were correct? Be assured of the highest quality, most accurate & complete product available for your vehicle. Phoenix Graphix provides officially licensed decals. Why take the risk to save a couple bucks from an unknown supplier? PHOENIX GRAPHIX A TRUSTED INDUSTRY NAME SINCE 1985. List your items fast and easy and manage your active items. The item "2000 Grand Prix Daytona 500 Nascar Pace Car Decals Stripes Kit" is in sale since Wednesday, September 2, 2015.